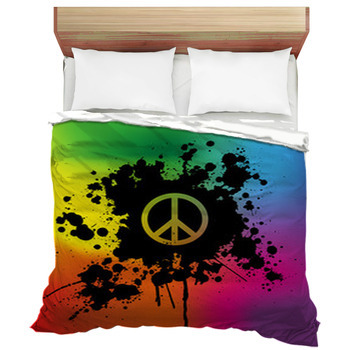 Spread a little peace around your bedroom and let the rainbow colors and flower power style embrace you. Peace signs, whether the circular form or the two finger sign, are international symbols recognized by nearly all cultures around the worlds. 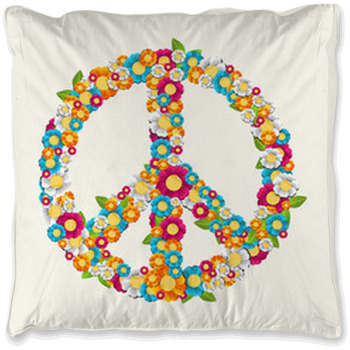 Let this quality radiate from your bedroom with peace sign bedding and bring peace to your sleep and dreams each night. 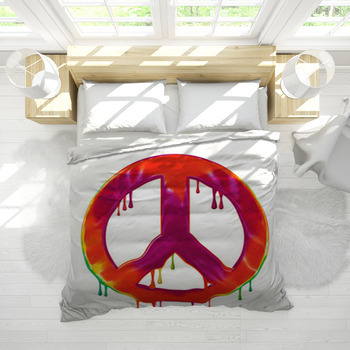 For anyone looking to decorate or redecorate their bedroom in a unique and colorful style, check out the love and peace-themed bedding here at VisionBedding. 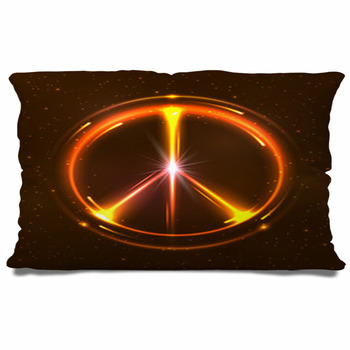 You'll discover lots of original peace sign designs unlike anywhere else. And if our designs aren't giving you peace of mind, then why not create your own? With our full personalization and customization options, you can find peace in your very own way. Alter the luminance of our colorful designs to make a muted and moody look. Go for full black and white hues if you want a peace sign as clean as your bathroom. 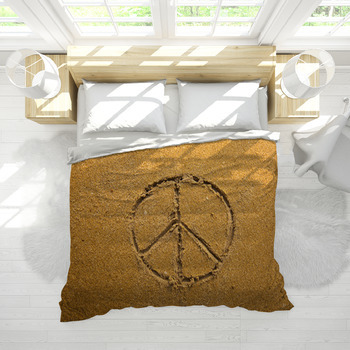 Even add your name, favorite quote, or just a message to your bedding and make it a true statement of your peaceful personality. 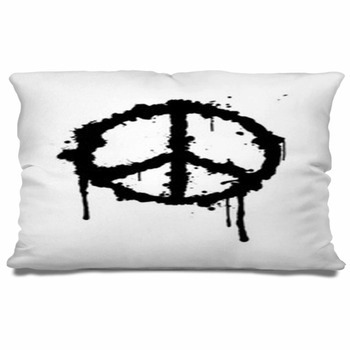 Treat yourself right by selecting peace sign design that's custom made just for you! We also offer a variety of custom and standard size to give peace to a bedroom of any size. Our products come in Twin, Twin XL, Queen, and King so you can feel peace from childhood to adulthood. 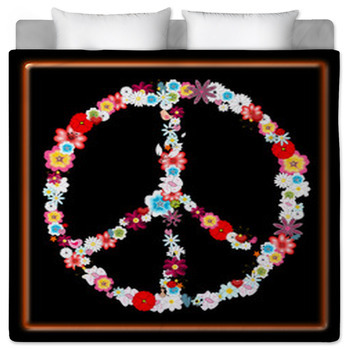 Try a comforter with a graffiti peace sign for an urban look, or perhaps a duvet cover with a peace sign composed of flowers for a look as bright as you are. 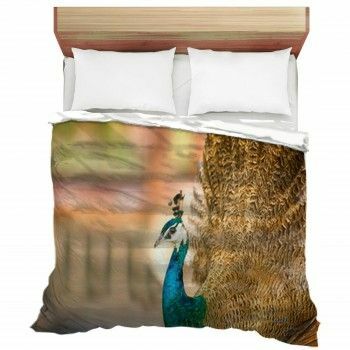 We even offer pillow cases and sheets that you can match in the pursuit of togetherness. 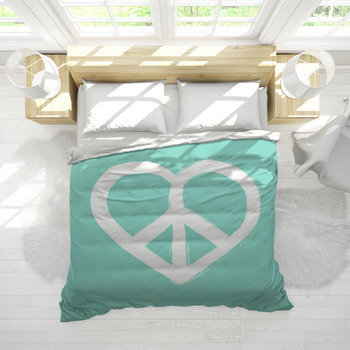 Create a fun and compassionate theme in any bedroom with this peace sign bedding. Reimagine peace in muted colors for a look tailored to your clean preferences. Curate a room in multi-colored peace to start your day with pure happiness. Consider evolving your style into every bedroom so peace can suffuse your house from top to bottom. 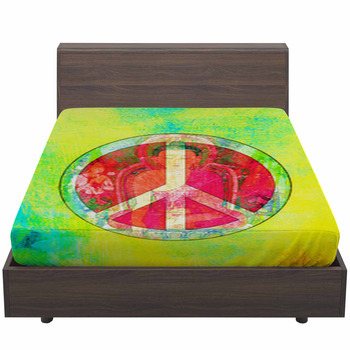 This peace sign bedding is ideal for the former hippie or new-age hippie alike. Remind yourself of those halcyon days when you protested for equal rights and equal treatment in the pursuit of peace. 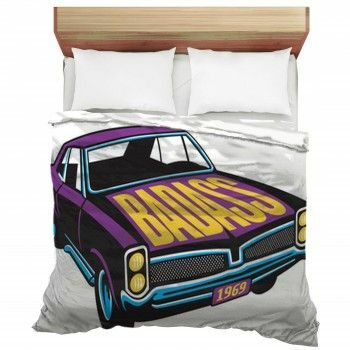 Embrace a modern peace in your bedroom with chic designs that will remind you of your vintage bedroom in your twenties. And if you're a new-age purveyor of peace, then let your artistic instincts flow with the calming speed of a river of peace.